It’s impossible to fish effectively when the wind is cutting through your shelter and your hands are frozen into a permanent claw shape. 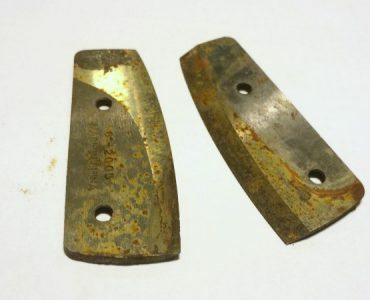 The next to go are your toes, and you suddenly don’t feel like fishing anymore. What a sad and miserable way to spend your limited time on the ice! Fortunately, you are thinking ahead and looking to find the best ice fishing heater for your portable shelter or ice house. 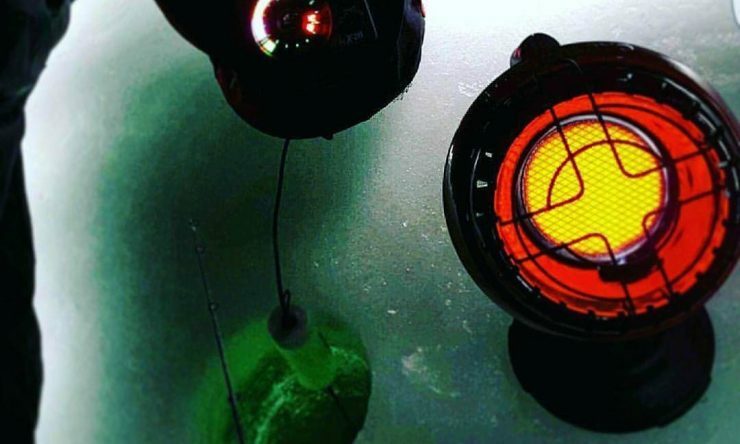 We’ve picked out 5 heaters that are great for ice fishing, one for every budget and type of ice shelter. For most ice tents it’s hard to beat the Mr. Heater Portable Buddy, but we recommend you look through all 5 portable heater reviews before choosing. Determining the best size heater (BTU output not physical size) is the first factor in determining which heater is best. The size should be determined by calculating the floor space inside the ice shelter and matching it to a heater. Example: A flip up shelter with a 7×5 foot floor has an area of 35 square feet. A Portable Buddy has a 250 square-foot rating and is probably too large to comfortably fit in the shelter. A Little Buddy heater is much more appropriate. Also remember that an undersized heater won’t heat the space efficiently, and struggle to keep up with the cold. A heater that is too big means less room to move inside the ice house and extra weight to carry. It’s a better idea to have a heater with a little more capacity, as you can use the heater on a lower setting, and reserve the max output for the coldest days. You’ll also be pleased at how quickly the bigger heater warms your ice tent, allowing you to get down to business faster. BTU is short for British Thermal Unit, which can be defined as the amount of heat needed to raise the temperature of 1 pound of water by one degree Fahrenheit. Rather than get all scientific, lets look at real world comparisons. 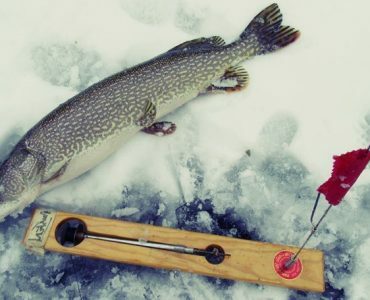 Portable heaters for ice fishing typically use 1lb propane canisters. They can put out anywhere from 2,500 to 15,000 BTU’s, with 10,000 BTU being the most popular. For the sake of comparison, the square or round kerosene heaters most people are familiar with for emergency home heat, or in a garage can produce upwards of 25,000 BTU. Again, you determine the ideal size heater by first measuring the space in your shelter. Most heaters will include the amount of space they are designed for in the product description. When in doubt, get the more powerful heater, so long as it still easily fits in the shelter. Burning fuel creates Carbon Monoxide as a byproduct, which is why it’s extremely important for your safety to choose a heater rated for indoor use. CO a silent killer that is totally preventable by having indoor rated heater and proper ventilation. Sadly, Carbon Monoxide kills too many ice fishermen every year, despite being totally preventable. 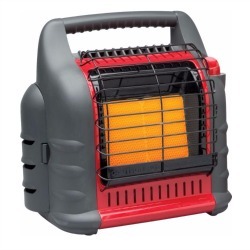 Unlike wall mounted heaters, portable ice fishing heaters are not integrally vented and must have an open-air source for fresh air to circulate into the shelter. It may seem counter intuitive to heat the ice shelter and have an open door, but the goal is get the inside temp warm enough to be comfortable, not to make a sauna. Whether built into the heater or as a separate piece of safety gear, an oxygen depletion sensor is very important to have when running a heater in an enclosed space. If the heater is running properly, with good ventilation, carbon monoxide buildup shouldn’t be an issue. But considering the consequence of CO poisoning can mean death, it’s a no brainer to have one somewhere in the shelter. Note: Every heater recommended below has a built in Oxygen Depletion sensor to alert anglers before dangerous amounts of CO has built up inside the shelter. Another important safety feature which most modern heaters have is that of an automatic shutoff valve if the heater is accidentally tipped over. When a heater is tipped on its side, a simple shutoff device immediately closes, turning off the supply of fuel. It’s easy to reset and light the heater again, but is proven to prevent accidental fires. There are lots of portable heaters you can buy, but most are not suitable for use in an Ice shelter. 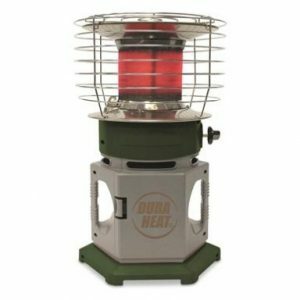 Mr. Heater is the most popular brand, but we found several other good ice fishing heaters to choose from. A heater is an important piece of gear, considering the impact being warm has on your ability to fish in freezing weather, so choose wisely! 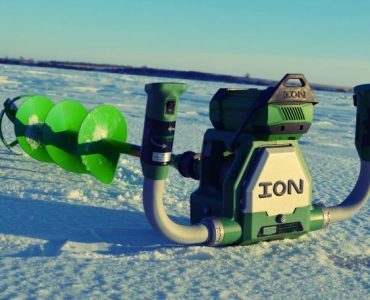 Pros: A powerful, safe, and reliable ice fishing heater. Easily heats ice shelters up to 400 square feet in size. Cons: At 17lbs it’s a bit heavy, and may be too large for many flip over and hub style shelters. For some reason, it cannot be sold in Massachusetts. Best Big Ice Fishing Heater: The Mr. Heater Big Buddy is one of the largest and most efficient ice fishing heaters you can buy. It runs off either two 1-pound propane bottle or a single 20 pound cylinder (you’ll need a separate hose). The Big Buddy is rated to heat up to 400 square foot spaces with an 8-foot ceiling (3200 cubic feet), which is a large ice fishing shelter. The Big Buddy is best used in bigger ice shelters, or medium sized ice tents where you know you’re going to be in subzero temperatures. That kind of cold requires the big BTU output of the Big Buddy. A nice feature for the big space is a battery powered blower fan to help radiate the heat outwards. It’s weighs 17lbs, which is rather heavy to haul to your shelter on foot all the time. The Big Buddy is best suited for driving in to your ice house, and perfect if you have a shelter which stays all winter. 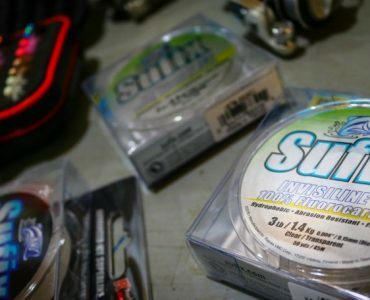 It’s also an excellent choice for extended ice fishing trips lasting multiple days. Pros: Perfect size and BTU output for most 1 and 2 man flip over and hub style ice houses. Cons: Biggest user complaint is ignition in the wind. Not an issue when used inside an ice shanty. 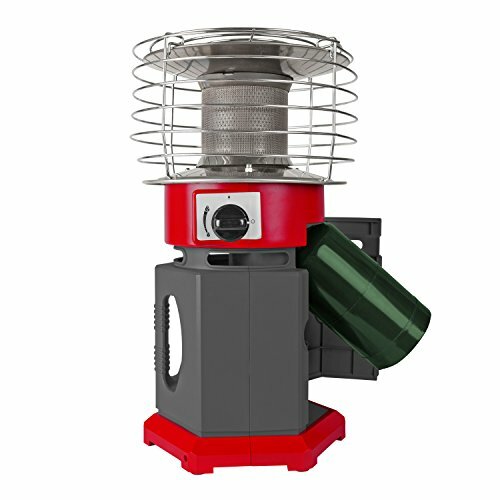 Best Overall Ice Fishing Heater: The Portable Buddy has the same basic design as the Big Buddy, just in a smaller form. The Portable Buddy can heat spaces up to 225 square feet running on a 1lb propane cylinder. The output selector can be set for 4,000 or 9,000 BTU, which is plenty of power for portable ice houses. 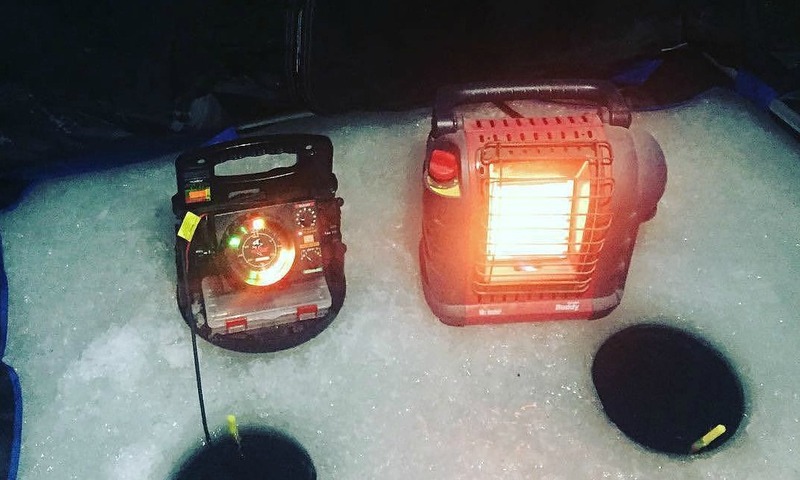 Based on the size, output, price, and strong user reviews, the Portable Buddy earns our recommendation as the best ice fishing heater for the money. Pros: Easy operation, carry handle, small enough to fit in a 5 gallon bucket, powerful enough to keep a flip over ice house warm. Cons: Biggest user complaint is the amount of heat generated, but the fact is the Little Buddy is designed to be compact for use in smaller tents. Best Compact Ice Fishing Heater: The Little Buddy is the most portable of all the heaters reviewed. 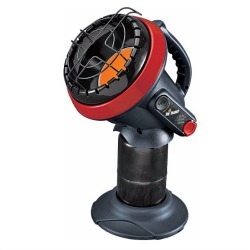 It’s built like a large flashlight, with a big handle and round heater body. It mounts directly on top of a 1lb propane cylinder, and sits in a plastic stabilization base. The small footprint fits perfectly in a 5 gallon bucket. Like I said, it’s great for small flip up ice shelters. It’s good to know the Little Buddy has all the important safety features of the bigger Mr. Heater models. 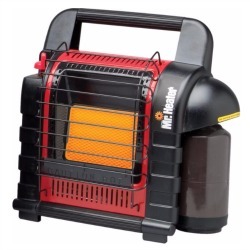 For the price, this is a good personal ice shanty heater where floor space is limited. Cons: Not super portable, carry case option costs more. Good Mr. Heater Alternative: The Dyna-Glow is a viable alternative to the Mr. Heater Portable Buddy. It has a lantern style design that puts off a full 360 degrees of heating. Perhaps it’s that 360 design that gives it a 250 square feet rating (vs 225sqft on the Portable Buddy). It’s easy to carry and small enough to fit in a bucket. This ice heater is best for small ice shacks and bigger pop up ice tents. Pros: Puts out a lot of heat for its size, plus 360 degrees of heat radiation, and cheaper than the Big Buddy. Cons: With handles on the base, not as easy to haul around compared to the Big Buddy heater. Best Cheap Heater: The DuraHeat Double runs on 2 propane cylinders and pumps out plenty of heat. The lantern style heater is great for the middle of an ice house, and can double as a safe heat source for an outdoor campsite or home patio. It is cheaper than the Big Buddy, and puts out just as much heat. Although it is portable and can be carried to where you need it, it is big and may not always be appropriate if you need a quick and temporary setup. Use this heater in permanent ice shelters where you don’t need to set up and take down frequently. Regardless of which heater you choose, it’s always important to remember the basic safety usage of your device. Place Heater on Stable Surface: Only use it on a stable surface where it’s unlikely to be run into, tipped over, and potentially start a fire. Place Away from Objects: Always follow the recommendations of the manufacturer, keeping walls and objects at least at the minimum distance they recommend. Use Proper Ventilation: Two things you should never assume in ice fishing is the ice is safe, and the shelter is ventilated. For portable shelters, keep the air flowing in the windows or doors, and take breaks outside if you can to get fresh air. Never Leave Unattended: Unattended heaters can cause fires if they tip or malfunction. It’s best to turn it off if you are stepping away for an extended time. If you are sleeping in the ice shack, make sure you use a CO detector!